A procedure for the synthesis of polystyrene-grafted multiwalled carbon nanotubes using successive chemical modification steps to selectively introduce the polymer chains to the sidewalls and their self-assembly via anisotropic patchiness is presented. Arenas-García, J., Escárcega-Bobadilla, M. V., Zelada-Guillén, G. A. Grafting Multiwalled Carbon Nanotubes with Polystyrene to Enable Self-Assembly and Anisotropic Patchiness. J. Vis. Exp. (134), e56267, doi:10.3791/56267 (2018). We demonstrate a straightforward protocol to graft pristine multiwalled carbon nanotubes (MWCNTs) with polystyrene (PS) chains at the sidewalls through a free-radical polymerization strategy to enable the modulation of the nanotube surface properties and produce supramolecular self-assembly of the nanostructures. First, a selective hydroxylation of the pristine nanotubes through a biphasic catalytically mediated oxidation reaction creates superficially distributed reactive sites at the sidewalls. The latter reactive sites are subsequently modified with methacrylic moieties using a silylated methacrylic precursor to create polymerizable sites. Those polymerizable groups can address further polymerization of styrene to produce a hybrid nanomaterial containing PS chains grafted to the nanotube sidewalls. The polymer-graft content, amount of silylated methacrylic moieties introduced and hydroxylation modification of the nanotubes are identified and quantified by Thermogravimetric Analysis (TGA). 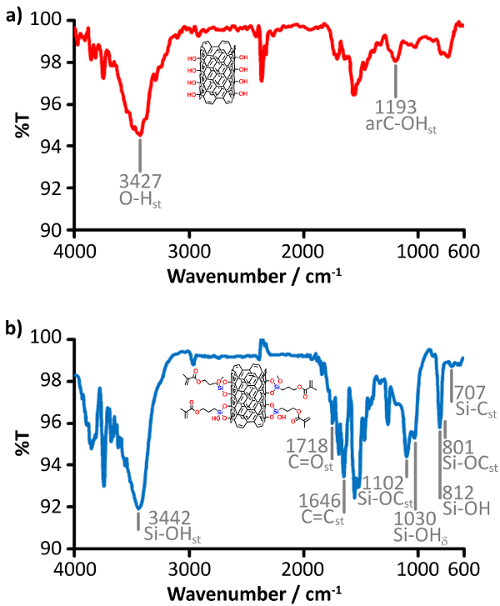 The presence of reactive functional groups hydroxyl and silylated methacrylate are confirmed by Fourier Transform Infrared Spectroscopy (FT-IR). Polystyrene-grafted carbon nanotube solutions in tetrahydrofuran (THF) provide wall-to-wall collinearly self-assembled nanotubes when cast samples are analyzed by transmission electron microscopy (TEM). Those self-assemblies are not obtained when suitable blanks are similarly cast from analogous solutions containing non-grafted counterparts. 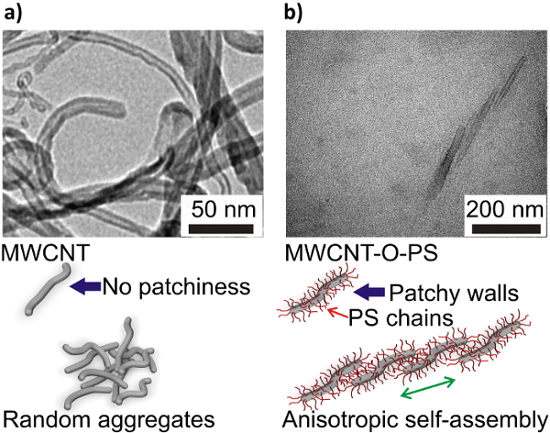 Therefore, this method enables the modification of the nanotube anisotropic patchiness at the sidewalls which results into spontaneous auto-organization at the nanoscale. Supramolecular self-assembly of molecular building blocks is one of the most versatile strategies to control the organization of matter at the nanoscale.14,15 In this sense, supramolecular interactions involve directional, short-range and mid-range non-covalent interactions such as H-bond, Van der Waals, dipole-dipole, ion-dipole, dipole-induced dipole, π- π stacking, cation-π, anion-π, coulombic, among others.16 Unfortunately, directionality in self-assembly for larger structures such as MWCNTs is not spontaneous and usually requires external motive forces (e.g. templates or energy dissipation systems).17 A recent report used non-covalent wrapping of nanotubes with tailored co-polymers to pursue the latter goal,18 but the use of covalent strategies to offer new alternatives to solve that problem have remained scarcely explored. Chemical modification of carbon nanotubes can be selectively carried out to introduce different functional groups either to the termini or to the sidewalls of the same.19,20 One of the most useful approaches to tailor the surface properties in carbon nanostructures is polymer-grafting through standard polymerization routes. Typically, those approaches involve the preliminary introduction of polymerizable or initiator groups (acrylic, vinyl, etc.) on the nanostructure surface and their successive polymerization with a suitable monomer.21 In the case of MWCNTs, the covalent introduction of polymer chains on the sidewalls to control their patchiness in an anisotropic fashion has remained a challenge. Here we will show how a series of straightforward chemical modification steps22,23 can be applied to insert PS chains on the sidewalls of MWCNTs in order to modify their surface patchiness and to promote their anisotropic self-assembly23 at the nanoscale. During the modification route, a first step allows for the selective hydroxylation of pristine MWCNTs at the sidewalls by following a biphasic catalytically mediated oxidation reaction to yield the hydroxylated counterparts namely, MWCNT-OH. A second step uses 3-(trimethoxysilyl)propyl methacrylate (TMSPMA) to introduce silylated methacrylic moieties to the previously created hydroxyl groups (MWCNT-O-TMSPMA). These inserts will provide surface reactive sites during a third step, when styrene monomer is polymerized from the methacrylic moieties thus yielding polymer chains grafted to the sidewalls of the nanotubes at the end (i.e. MWCNT-O-PS). Add 2.5 g of pristine MWCNTs to a watch glass, Petri dish or beaker. Move the container into an 80 °C vacuum oven and cover with a suitable watch glass. Turn on the vacuum pump of the oven and set the system to ca. 200 mmHg. Dry the nanotubes in the vacuum oven for 12 h. After this step, the water content in the MWCNTs will be eliminated. Pour the dried MWCNTs into a 100 mL round bottom flask with a glass funnel and a spatula and remove the funnel once finished. Introduce a magnetic stirring bar to the round bottom flask and add ~ 50 mL of 99% dichloromethane into the flask using a beaker. Stir at 60 rpm using a stirring plate until agglomerates disappear. If agglomerates remain in solution after stirring for 10 min, move the flask into an ultrasonic bath and turn on the system for 5 min. Repeat sonication if necessary. This solution will be the organic phase in the oxidation reaction stage. In a 25 mL beaker, dissolve 0.6 g of tetrapropylammonium bromide (TPABr) in 5 mL of distilled water using a magnetic stirring bar and a stirring plate. In a 10 mL volumetric flask, dissolve 0.253 g KMnO4 in distilled water (0.16 M solution) and keep the solution in a beaker at hand. This solution will be used in Step 1.1.2.4. Take 5 mL of glacial acetic acid (HOAc) and transfer the volume drop-wise to the TPABr solution. Using a graduated pipette and constant stirring in an ice bath may be helpful. NOTE: The mixture process is exothermic, therefore, the addition should be carried out slowly to avoid possible injuries by projected droplets or an excessive warming. Transfer a 5 mL aliquot of the 0.16 M KMnO4 aqueous solution to the acidified TPABr solution. Using a clean graduated pipette and stirring may be helpful. Keep the previous solution covered with a watch glass until needed. This solution will be the aqueous phase in the oxidation reaction stage. Pour the aqueous phase into the round bottom flask that contains the organic phase. This mixture will be the biphasic reaction mixture. Using the stirring plate, agitate the biphasic system at 80 rpm or more and leave the mixture under stirring at room temperature for 24 h. After this time, the violet aqueous phase turns pale pink and the nanotubes become hydroxylated (MWCNT-OH). Transfer the biphasic reaction mixture to a 150 mL or 200 mL separatory funnel with the stopcock at the closed position. Use a glass funnel and a spatula if needed. Using a Beral pipette, a Pasteur pipette with a rubber bulb attached or a beaker, add ~ 0.25 mL of concentrated hydrochloric acid into the separatory funnel. Close the separatory funnel with a Teflon stopper (do not use glass stoppers for carbon nanotubes) and agitate vigorously for 5 s in a fume hood with the sash window down. During agitation, always hold the stopper strongly attached to the funnel with one hand and grab the stopcock with the other hand. Immediately after the agitation step, turn the funnel upside down and release the pressure build-up by opening the stopcock with the respective hand. NOTE: Make sure to address the pressure direction to the rear of the fume food. Repeat the last two agitation/pressure-release steps in cycles of 3 - 5. Once the last cycle is finished, immediately remove the stopper and leave the funnel clamped and undisturbed until phase separation is evident. After liquid-liquid separation, the aqueous phase remains above the organic phase. The MWCNT-OH will remain at the organic phase. If no phase separation occurs, add 1 - 5 mL of brine (10 - 20% NaCl in water, m/v) to the separatory funnel using a Beral pipette or a Pasteur pipette, mix gently and leave the mixture undisturbed until phase separation. Repeat until needed. Recover the organic phase on a 150 mL beaker keeping the stopcock open until the phase boundary reaches the stopcock position. A 150 mL Erlenmeyer flask can be alternatively used to recover the organic phase; however, retrieval of nanotubes from this container type is usually more difficult. Keep the recovered solution protected with a watch glass until filtration. Discard the aqueous phase appropriately. Set the vacuum filtration system seating the stopper and base firmly into the neck of a clamped Kitasato flask. Keep a 47 mm diameter membrane filter at hand and, depending on the membrane material and indications from the manufacturer, optionally follow this step and the next two ones (Steps 1.2.2.2 - 1.2.2.4). Prepare a 100 mm diameter Petri dish with ethanol (EtOH) filling 50% of its capacity. With smooth-tip forceps, place the 47 mm diameter membrane filter on the Petri dish with EtOH. Leave the membrane in EtOH for 2 - 5 min. Make sure to use a membrane with a pore size 0.45 - 20 µm. Smaller pore sizes will clog the filtration, while larger ones will reduce filtering efficiency. Remove the membrane from the EtOH using the smooth-tip forceps. Center the membrane on the sintered glass area of the filter support surface starting by the edge of the membrane. The optional wetting with EtOH may facilitate this step. Center the flange of the funnel on top of the assembly. Do not disturb the membrane. Lock the funnel and base together with the spring clamp. Connect the system to the vacuum source. Do not turn the vacuum on until needed. Pour the retrieved organic phase into the vacuum filtration funnel aided by a glass rod. Apply vacuum to filter the sample until dryness. Wash the solid with 40 - 50 mL of 95% methanol (MeOH) using a wash bottle. Using a glass rod may be helpful in this task. Repeat this process at least 5 times. Keep the vacuum on during this step. After washing, leave the system under vacuum for 20 min covered with a glass watch to dry the solid. In order to recover the solid from the membrane, follow the next Steps 1.2.3.5 - 1.2.3.8. Carefully, remove the spring clamp, then vertically remove the funnel without disturbing the membrane and the solid. Very carefully, remove the membrane together with the solid from the filter support surface aided by a spatula and the smooth-tip forceps. Transfer the membrane with the solid to a 100 mm diameter Petri dish or watch glass. Aided by two smooth-tip forceps and a spatula, recover the solid from the membrane surface until all the product is deposited on the Petri dish/watch glass. Cover the Petri dish/watch glass with a suitable watch glass (larger diameter is required). NOTE: Do not use sealing film to avoid electrostatic charging. Introduce the Petri dish/watch glass into a vacuum oven heated at 80 °C. Turn on the vacuum pump of oven and set the system to ca. 200 mm Hg. Dry the solid for 24 h. After this step, the solvent content in the product will be eliminated. If the product will not be used immediately, store the solid in a desiccator until needed. Pour 2.5 g MWCNT-OH and 5 g of hydroquinone into a clean 100 mL Schlenk flask using a glass funnel and a spatula, remove the funnel and introduce a magnetic stirring bar. Connect the Schlenk flask to the vacuum/inert gas manifold system using a suitable rubber tubing attached to the flask's glass joint. Keep the flask's manifold closed. Connect a suitable condenser to the tap water system using suitable rubber tubing, making sure to set the water income through the glass joint closest to the male joint. Lubricate the male joint of the condenser with an evenly applied fine layer of vacuum grease. NOTE: The joint should not be over-greased to avoid product contamination. Attach the condenser's male joint to the Schlenk flask's neck. Close the condenser's female joint with a rubber stopper. Carefully, open the flask to the vacuum. Make sure that the nanotubes are not sucked up into the vacuum line during this process. Fill the Schlenk flask with N2 gas. Repeat the last two steps two more times. Keep the system under positive N2 gas flow. Aided by a clean cannula and a suitable syringe, slowly inject 50 mL dry toluene through the rubber stopper. Using the stirring plate and a thermal bath, agitate the mixture vigorously at 80 rpm or more and leave the mixture under stirring for 5 - 10 min at room temperature. Using a clean cannula and a syringe, inject 5 mL of TMSPMA through the rubber stopper. Set the temperature to 100 °C and leave the reaction under reflux and stirring for 12 h. After this time, silylated methacrylic moieties are chemically couple to the hydroxyl groups on the MWCNTs (namely MWCNT-O-TMSPMA). Once the reaction is over, carefully remove the rubber stopper, close the N2 flow and wait until the flask is at room temperature. Set a vacuum filtration system (Step 1.2.2). Filter the solid (Step 1.2.3). Wash with MeOH in excess. Dry and store the MWCNT-O-TMSPMA (Step 1.2.4). Pour 2.5 g of the MWCNT-O-TMSPMA and 75 mg of azobisisobutyronitrile (AIBN) into a clean 100 mL Schlenk flask using a glass funnel and a spatula and remove the funnel. Caution: AIBN powder should not be exposed to heat or strongly oxidizing agents, as it may spontaneously explode. Introduce a magnetic stirring bar to the Schlenk flask. Set the Schlenk flask into reflux mode (Step 2.1.2). Using a clean cannula and a syringe, inject 50 mL dry toluene through the rubber stopper. Using the stirring plate and the thermal bath, agitate the mixture at 80 rpm or more and leave the mixture under stirring for 5 - 10 min at room temperature. Aided by a clean cannula and a syringe, inject 7.5 mL of styrene through the stopper. Set the temperature to 70 °C and leave the reaction under reflux, stirring and N2 for 12 h. After this time, PS chains are grafted to the nanotube sidewalls (MWCNT-O-PS). Open the system to the air, close the N2 flow and cool the flask to room temperature. Filter and wash the solid (Step 1.2.3). Use acetone instead of MeOH during the washing step. Wash the solid five times more with 20 mL THF to remove unbound polystyrene. Dry and store the MWCNT-O-PS (Step 1.2.4). NOTE: The length of the polymer chain grafted to the nanotubes can be tuned by changing the concentration of styrene in toluene during the polymerization step; lower concentrations produce shorter chains. The polymerization reaction time can be used to adjust the polymer chain size; shorter reaction times reduce the length of the chains. See references 22 and 23 for details. Figure 1: Quantitative characterization of chemical modifications on carbon nanotubes. TGA curves for pristine MWCNTs (black), MWCNT-OH (red), MWCNT-O-TMSPMA (blue) and MWCNT-O-PS (green). Grey text and dashed lines indicate the temperature zones where each component is typically decomposed. Figure 2: Confirmation of reactive functional groups introduced to carbon nanotubes. FT-IR spectra for: a) MWCNT-OH (red) and b) MWCNT-O-TMSPMA (blue). Grey text and solid lines indicate the position of relevant bands to confirm the presence of the introduced reactive groups. Inserted figures are schematic representations for the modified nanotubes. Figure 3: Anisotropic self-assembly of polymer-grafted carbon nanotubes. TEM images (above) from solutions in THF after solvent evaporation for: a) pristine MWCNTs, b) MWCNT-O-PS. Schemes below each micrography are a representation for the typical nanoscale behavior of the nanostructures. Reproduced and adapted from Ref. 23 with permission from the Royal Society of Chemistry. In this method, there are some steps which result critical to guarantee a successful grafting process. First, the biphasic catalytically mediated oxidation reaction (Step 1.1) should be carried out with recently dispersed carbon nanotubes (Step 1.1.1.5). If dispersion results unviable according to the recommendations in the protocol, the use of an ultrasonic tip sonicator would be helpful if using the same indications (Step 1.1.1.6). Using shorter MWCNTs may also help in solving dispersion issues. Second, setting of the vacuum filtration system is crucial in purification efficiency (Step 1.2.2). In this sense, centering the membrane on the sintered glass area of the filter support surface (Step 1.2.2.5) may result in membrane wrinkles if the procedure is not followed appropriately (particularly, Steps 1.2.2.5 - 1.2.2.6). If the latter occurs, repeat Steps 1.2.2.3 to 1.2.2.5 until homogeneous filter adhesion is obtained. Alternatively, also try with non-wetted membrane versions (i.e. do not follow Steps 1.2.2.2 - 1.2.2.4) and observe filtration results. The use of dry membranes prevents the occurrence of membrane wrinkles during their fixation in Steps 1.2.2.5 - 1.2.2.6, while, depending on the membrane material used and selected manufacturer, cutoff size may vary between dry and wet versions and filtration efficiency might be affected depending on the case. Third, the polymerization reaction is the last critical step (Step 2.2). The most common source of inefficient polymerization is the use of non-purified monomer. Make sure to use freshly purified styrene using an alumina gel preparative column, cover the container with aluminum foil to protect the monomer from light and keep stored at 4 °C until used. The use of MWCNTs with a larger diameter or shorter lengths should not reflect any representative variation in the final outcomes. However, limitations may arise if SWCNTs, double-wall carbon nanotubes or MWCNTs with a shorter diameter are used. The use of the previous three examples may result into decomposition of the nanotube structure if the oxidation reaction (Step 1.1.3) is carried out for the same reaction time. Troubleshooting of the latter may be done by testing shorter times and performing TGA and FT-IR analysis to confirm optimal results. TGA is the simplest method for monitoring the success in each chemical modification step. A direct analysis of the mass losses and temperature values where these occur in TGA curves obtained between room temperature and 1000 °C allow for a quantification of the modification yield in the products (Figure 1). The TGA curve for the pristine MWCNTs exhibits one single drop in mass between 550 °C and 820 °C for up to 96% in weight (black curve in Figure 1). This loss in mass corresponds to the decomposition of the nanotubes when the analysis is carried out under air flow. Beyond 820 °C a constant weight is observed due to remaining inorganic impurities in the raw product. 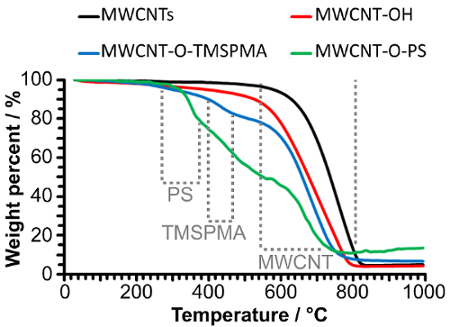 Under the same analysis conditions, MWCNT-OH (red curve in Figure 1) shows an additional weak drop between 200 °C and 300 °C in comparison with the MWCNT curve.22 The difference in weight percent between the MWCNT curve and the MWCNT-OH at the end of the previous range indicates the content in hydroxyl groups inserted to the nanotube sidewalls during the biphasic catalytically mediated oxidation reaction. Typical hydroxyl content for MWCNT-OH is found between 2% and 5% in weight. Besides, an absence of this additional weight drop indicates that the hydroxylation reaction did not occur. Beyond that temperature range, a complete decomposition of the nanotubes occurs earlier at 800 °C, while higher temperatures afford a constant weight value. On the other hand, a typical TGA curve for MWCNT-O-TMSPMA shows two consecutive drops in weight under the same air flow conditions (blue curve in Figure 1). The first mass loss is found between 380 °C and 470 °C, which corresponds to the decomposition of the methacrylic moieties from the TMSPMA inserted to the hydroxylic groups; the temperature interval is in agreement with the literature22,25 for TMSPMA similarly inserted to different types of nanostructures via covalent chemistry. The second drop starts at 550 °C and ends at 790 °C. This weight loss is originated by the decomposition of carbon in the nanotubes. The constant value in mass observed after this temperature interval corresponds to both the remaining inorganic matter from the original nanotubes and non-volatile silicate derivatives formed during the decomposition of the TMSPMA moieties. The relationship between the first weight drop compared with the second one corresponds to the content in TMSPMA in the nanotubes. In this sense, the first loss is typically of 8% to 12% in weight compared with the second drop. The absence of the first weight drop is evidence of failure in the coupling of TMSPMA to the hydroxyl groups. Finally, a representative TGA curve for MWCNT-O-PS (green curve in Figure 1) shows three clear variations in weight under air flow, if compared with the pristine counterparts. The first drop occurs between 270 °C and 380 °C and is produced when the polystyrene chains grafted to the nanotubes are decomposed; this interval of temperature is in accordance with the literature22,26 for PS grafted to different types of carbon materials through covalent procedures. The second weight loss starts at ca. 400 °C and ends at 480 °C, which is produced by the loss of the methacrylic component from TMSPMA. The third drop appears at around 600 °C and ends at 780 °C and is a result of the decomposition of the nanotubes. The ratio between the first weight drop and the third one provides the PS content in the polymer-grafted nanotubes. Typical content in PS for MWCNT-O-PS is found between 30% and 40% in weight compared with the nanotube content.23 Lack of the first weight drop is evidence of failure in the polymerization step. The FT-IR spectra can be useful to confirm the presence of the reactive functional groups introduced to the pristine MWCNTs (Figure 2). Those groups include the hydroxyls and the silylated methacrylic moieties. Typically, spectra from MWCNT-OH (red curve, Figure 2a) show a broad strong band at 3427 cm-1, which corresponds to the stretching of O-H groups. Additionally, a weak but clear band can also be found at 1193 cm-1 produced by the stretching of the bonds between the aromatic carbons in the nanotube walls and the OH groups. On the contrary, spectra from MWCNT-O-TMSPMA (blue curve, Figure 2b) show a strong band at 3442 cm-1 produced by the stretching of Si-OH bonds. The same bonds also produce two additional moderate bands at 1030 cm-1 and 812 cm-1, respectively. In addition, the carbonyl C=O bond in the ester group of the methacrylic moieties afford a weak stretching band at 1718 cm-1. Moreover, Si-OC bonds formed between the TMSPMA group and the nanotube give two typical moderate bands appearing at 1102 cm-1 and 801 cm-1, whereas the last band is partially overlapped to the neighboring band at 812 cm-1 from Si-OH. Methacrylic C=C bonds in the inserted TMSPMA moieties give one moderate stretching band at 1646 cm-1. Finally, Si-C bonds contained in the silylated portion provide a weak but clear stretching band at 707 cm-1. An absence of the bands at 1102 cm-1 and 801 cm-1 indicates two possibilities: 1) failure in the covalent linking between TMSPMA and the hydroxyl groups at the nanotubes and 2) inefficient elimination of reactants. The lack of the bands at 1718 cm-1 and 1646 cm-1 shows that undesired hydrolysis of the ester group occurred during product purification (e.g. by mistakenly washing with acids or bases). Microscopic analysis of drop-cast solutions using THF as solvent can show the typical self-assembly behavior in MWCNT-O-PS which does not occur in pristine counterparts (Figure 3).23 Solutions from pristine MWCNTs analyzed by TEM after evaporation afford typical random networks of nanotubes or clusters (Figure 3a). However, equivalent samples prepared from MWCNT-O-PS provide aligned nanostructures which contain collinear nanotubes self-assembled by the walls (Figure 3b). This auto-organization behavior is produced by the anisotropic patchiness generated by the polystyrene chains grafted to the sidewalls of the nanotubes. Typical examples for self-organized nanotubes provide assembled bodies which contain between two and six nanotubes adhered to each other along the longitudinal axis thereof. Failure in polymer-grafting typically results in absence of that trend. We have demonstrated a method for obtaining multiwalled carbon nanotubes with anisotropic self-assembly properties via grafting polystyrene chains on the sidewalls using a free-radical polymerization route. Such a selective modification of the surface properties of the nanotubes is obtained by successive chemical modification steps to insert reactive functional groups selectively to the sidewalls. These successive modifications allow for the modulation of the surface patchiness which finally results into collinearly auto-organized nanostructures through non-covalent interactions. We expect that this strategy can be re-applied to other acrylic- or vinyl-derivative polymer types and new hybrid materials and composites could arise in a future. Moreover, we believe that this method would open new opportunities in carbon nanotube processing strategies under attractive conditions for the industry and academia. We would like to acknowledge the FQ-PAIP and DGAPA-PAPIIT programs from National Autonomous University of Mexico (grant numbers 5000-9158, 5000-9156, IA205616 and IA205316) and the National Council for Science and Technology from Mexico -CONACYT- (grant number 251533). Iijima, S. Helical Microtubules of Graphitic Carbon. Nature. 354, 56-58 (1991). Iijima, S., Ichihashi, T. Single-Shell Carbon Nanotubes of 1-nm Diameter. Nature. 363, 603-605 (1993). Dai, H. Carbon Nanotubes: Synthesis, Integration and Properties. Acc. Chem. Res. 35, 1035-1044 (2002). Karousis, N., Tagmatarchis, N. Current Progress on the Chemical Modification of Carbon Nanotubes. Chem. Rev. 110, 5366-5397 (2010). Zhao, Y. L., Stoddart, J. F. Noncovalent Functionalization of Single-Walled Carbon Nanotubes. Acc. Chem. Res. 42, 1161-1171 (2009). Zelada-Guillén, G. A., Riu, J., Düzgün, A., Rius, F. X. Immediate Detection of Living Bacteria at Ultralow Concentrations Using a Carbon Nanotube Based Potentiometric Aptasensor. Angew. Chem. Int. Ed. 48, 7334-7337 (2009). Zelada-Guillén, G. A., Blondeau, P., Rius, F. X., Riu, J. Carbon Nanotube-Based Aptasensors for the Rapid and Ultrasensitive Detection of Bacteria. Methods. 63, 233-238 (2013). Jung, Y., Li, X., Rajan, N. K., Taylor, A. D., Reed, M. A. Record High Efficiency Single-Walled Carbon Nanotube/Silicon p-n Junction Solar Cells. Nano Lett. 13, 95-99 (2013). Escárcega-Bobadilla, M. V., Rodríguez-Pérez, L., Teuma, E., Serp, P., Masdeu-Bultó, A. M., Gómez, M. Rhodium Complexes Containing Chiral P-Donor Ligands as Catalysts for Asymmetric Hydrogenation in Non Conventional Media. Chem. Soc. Rev. 141, 808-816 (2011). Miners, S. A., Rance, G. A., Khlobystov, A. N. Chemical Reactions Confined within Carbon Nanotubes. Chem. Soc. Rev. 45, 4727-4746 (2016). Rege, K., Raravikar, N. R., Kim, D. Y., Schadler, L. S., Ajayan, P. M., Dordick, J. S. Enzyme-Polymer-Single Walled Carbon Nanotube Composites as Biocatalytic Films. Nano Lett. 3, 829-832 (2003). Ma, R., Menamparambath, M. M., Nikolaev, P., Baik, S. Transparent Stretchable Single-Walled Carbon Nanotube-Polymer Composite Films with Near-Infrared Fluorescence. Adv. Mater. 25, 2548-2553 (2013). De Volder, M. F. L., Tawfick, S. H., Baughman, R. H., Hart, A. J. Carbon Nanotubes: Present and Future Commercial Applications. Science. 339, 535-539 (2013). Lehn, J. M. Perspectives in Chemistry - Steps towards Complex Matter. Angew. Chem. Int. Ed. 52, 2836-2850 (2013). Mattia, E., Otto, S. Supramolecular Systems Chemistry. Nat. Nanotechnol. 10, 111-119 (2015). Leh, J. M. Supramolecular Chemistry: Concepts and Perspectives. VCH Verlagsgesellschaft GmBH. Weinheim, Germany. (1995). Escárcega-Bobadilla, M. V., et al. Nanorings and Rods Interconnected by Self-Assembly Mimicking an Artificial Network of Neurons. Nat. Commun. 4, 2648 (2013). Gegenhuber, T., et al. Noncovalent Grafting of Carbon Nanotubes with Triblock Terpolymers: Toward Patchy 1D Hybrids. Macromolecules. 48, 1767-1776 (2015). Peng, H., Alemany, L. B., Margrave, J. L., Khabashesku, V. N. Sidewall Carboxylic Acid Functionalization of Single-Walled Carbon Nanotubes. J. Am. Chem. Soc. 125, 15174-15182 (2003). Furtado, C. A., Kim, U. J., Gutierrez, H. R., Pan, L., Dickey, E. C., Ecklund, P. C. Debundling and Dissolution of Single-Walled Carbon Nanotubes in Amide Solvents. J. Am. Chem. Soc. 126, 6095-6105 (2004). Jeon, J. H., Lim, J. H., Kim, K. M. Fabrication of Hybrid Nanocomposites with Polystyrene and Multiwalled Carbon Nanotubes with Well-Defined Polystyrene via Multiple Atom Transfer Radical Polymerization. Polymer. 50, 4488-4495 (2009). Kim, M., Hong, C. K., Choe, S., Shim, S. E. Synthesis of Polystyrene Brush on Multiwalled Carbon Nanotubes Treated with KMnO4 in the Presence of a Phase-Transfer Catalyst. J. Polym. Sci. Pol. Chem. 45, 4413-4420 (2007). Oliveira, E. Y. S., Bode, R., Escárcega-Bobadilla, M. V., Zelada-Guillén, G. A., Maier, G. Polymer Nanocomposites from Self-Assembled Polystyrene-Grafted Carbon Nanotubes. New J. Chem. 40, 4625-4634 (2016). Shriver, D. F., Drezdzon, M. A. The Manipulation of Air-Sensitive Compounds. John Wiley and Sons. New York, NY, USA. (1986). Bressy, C., Ngo, V. G., Ziarelli, F., Margaillan, A. New Insights into the Adsorption of 3-(Trimethoxysilyl)-propylmethacrylate on Hydroxylated ZnO Nanopowders. Langmuir. 28, 3290-3297 (2012). Wu, X., Qiu, J., Liu, P., Sakai, E., Lei, L. Polystyrene Grafted Carbon Black Synthesis via in situ Solution Radical Polymerization in Ionic Liquid. J. Polym. Res. 20, 167 (2013).